Glucose-6-phosphate dehydrogenase (G6PD) deficiency is a condition in which red blood cells break down when the body is exposed to certain drugs or the stress of infection. It is hereditary, which means it is passed down in families. G6PD deficiency occurs when a person is missing or does not have enough of an enzyme called glucose-6-phosphate dehydrogenase. This enzyme helps red blood cells work properly. Too little G6PD leads to the destruction of red blood cells. This process is called hemolysis. When this process is actively occurring, it is called a hemolytic episode. The episodes are most often brief. 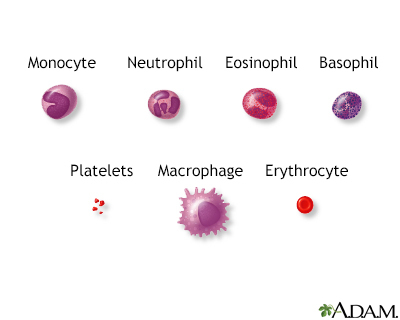 This is because the body continues to produce new red blood cells, which have normal activity. Other chemicals, such as those in mothballs, can also trigger an episode. In the United States, G6PD deficiency is more common among blacks than whites. Men are more likely to have this disorder than women. A form of this disorder is common in whites of Mediterranean descent. This form is also associated with acute episodes of hemolysis. Episodes are longer and more severe than in the other types of the disorder. People with this condition do not display any signs of the disease until their red blood cells are exposed to certain chemicals in food or medicine. A blood test can be done to check the level of G6PD. In most cases, hemolytic episodes go away on their own. In rare case, kidney failure or death may occur following a severe hemolytic event. Call your health care provider if you have symptoms of this condition. Call your provider if you have been diagnosed with G6PD deficiency and symptoms do not disappear after treatment. People with G6PD deficiency must strictly avoid things that can trigger an episode. Talk to your provider about your medicines. Genetic counseling or testing may be available to those who have a family history of the condition. Gallagher PG. Hemolytic anemias. In: Goldman L, Schafer AI, eds. Goldman-Cecil Medicine. 25th ed. Philadelphia, PA: Elsevier Saunders; 2016:chap 161. Lissauer T. Haematological disorders. In: Lissauer T, ed. Illustrated Textbook of Paediatrics. 5th ed. Philadelphia, PA: Elsevier; 2018:chap 23.